Mary and Marjorie Madden (twins) were born on 15th July 1902 to Rev. Wyndham Madden and his wife Evelyn Bather. In 1911 the Maddens with their six children moved from Shropshire in England to Waldo, to take up farming. The other children were Hester Charlotte (14/9/1896), Rachel (28/3/1898), Wyndham Ralph Carlyon (6/12/1899), and Humphrey (14/10/1906). 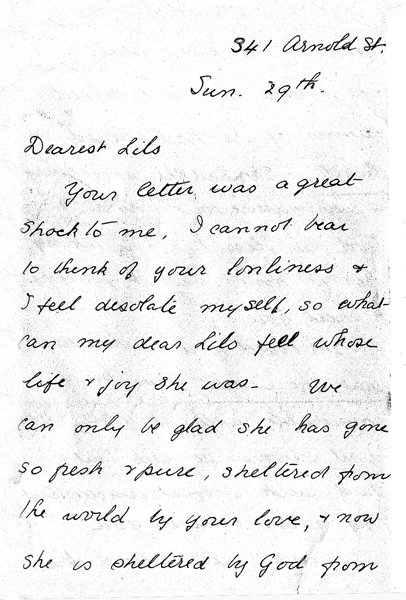 Marjorie died of pneumonia on 8th November 1916. The following year Mary was brought by her father to Quatsino, for a change of air, working for a year with her cousins Lilian and Charles. Mary, now 15, liked working on the homestead and at the end of the planned year she decided to stay on longer. In 1920 her parents encouraged her to return to Waldo. She refused and remained at the homestead until 1926 when she received news that her father was dying. She returned to the family home in South Turner Street, Victoria, British Columbia, to be with her father, who died of TB later that year aged 77. After his death Mary remained on in Victoria to care for her mother. The family home was sold in 1928 and Mary and her mother moved to 341 Arnold Street. In September 1932, Charles and Jackie left the homestead at Quatsino and went to Vancouver where they both got a bad dose of ‘flu and Mary went to Vancouver to care for them. She remained with them and in May 1935 they moved back to the homestead. Mary’s mother Evelyn died in 1936 aged 71. Mary Madden died in December 1991 aged 89 and is buried in Quatsino Cemetery. Your letter was a great shock to me. I cannot bear to think of your lonliness and I feel desolate myself. So what can my dear Lils feel whose life and joy she (Patricia) was. We can only be glad she has gone so fresh and pure, sheltered from the world by your love, and now she is sheltered by God from the sorrows and trials which she could not have helped having if she had stayed on earth. She had the most loving and pure nature that I know, and God has blessed her by taking her to him, to wait for you and meet you. She loved you so much that she would have been miserable without you and you will always be glad that you had such perfect understanding and love between you. It was such a hard illness for you to bear, and the doctor was so beastly, but through all it was the hand of God, and you cannot blame yourself as you might have done if it had been ‘flu. Cheer up darling Lils, God does try you sorely, but his reward will be great if you still have faith in his goodness. It is so desolate for you and I feel it so much, it can only be for her good and we must give cheerfully. I am afraid Doug will be very lonely and so will poor little Jack. Pat was always so good to him and thought so much of the little rogue when he was a babe and was so eager for him to talk. I love him for taking up your breakfast to you, dear little fellow. He will do his best though it is so small and he cannot be the same as Patricia to you. It is a hard life for him but I know he will do his best and get the best out of it – Bless his little soul. I should like a snap of him if you have one. I have been thinking of writing to you for at least a month. We children have all been left some money by our uncle, though it has not come yet, and I thought of paying for Jackie’s schooling so that he would have the drilling and association with other boys that would be good for him, only it would have to be a school of decent English boys, though I don’t know how much that would cost, and I was going to ask you what you thought of it. I cannot see my way to coming back (to Quatsino) at present. My mother is totally dependent on me for guidance and occupation, and how could I fit in up there when I do not love Mr B. I do see the great value of that life and work, but if I only irritate the cause, what is the use of coming. I am trying to do right here, and my little belief and aim is that no circumstance of any sort can prevent me from being, what God made me to be, perfect in myself. He has made me without fault if I will but fill in the parts and look to Him. If I am not good here, I will not be good there, and I have no one to blame but myself, here or there. I am so slow to follow my thoughts, but may God speed. I exercise quite often and am reading Emerson’s essays at present – (funny how you come to read what you never thought you could digest!) I spend my time housekeeping, gardening and taking mother for walks etc. I am sending you some lovely pale blue Delfinium seeds and Poppy, saved out of my garden. I was so glad to hear in the letter before, of all the doings of cows and chickens. So sorry to hear you have had such a horrid year. It has been lovely here since June. Could you not come down and have a quiet talk? Please do; on Government Street where it runs into Dallas Road. I will be waiting for you if you do and we will have a walk in the ‘wild’ stretch of the park. Stay at the New Y, and phone me at 70969, or write. I picked a bunch of Pansies for Patricia yesterday and will send them to you when they are dry. The flowers you picked sound so nice and what she would love. I am so stupid, I do not know quite where Nordstrum’s is. Do tell me. Do you remember those four hankies Patricia made for me and embroidered so beautifully. I have always treasured them and use them and have got the brown paper case she made me for them. I left one of them behind. It was a rose – my favourite. I wonder if it is still in the land of the living. I see mother has written . I don’t know what she has said. Oh Lils I love you.